The resemblances are startling. New Zealand trailed Australia by 290 runs in Perth in 1988-89, India trailed New Zealand by 315 in Napier in 2008-09. For New Zealand the rescuer was a man who would turn into an innovative pinch-hitting opener. In Napier it was one who until last year was considered a one-day specialist. 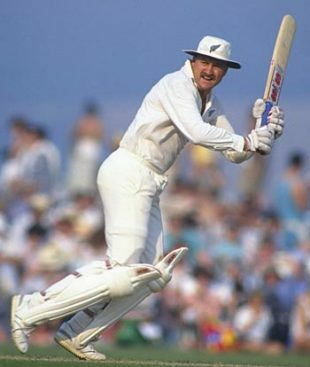 Mark Greatbatch batted for 655 minutes, played 435 deliveries, and hit 17 boundaries in his 146 not out. Gautam Gambhir batted 643 minutes, faced 436 deliveries, and hit 18 boundaries in his 137. Greatbatch looks back at his Perth marathon. What do you remember of the lead-up to that innings? We played Australia in Two tests, one in Australia in Perth, in November, then another one back in new Zealand, in Wellington, in February. Wasn't really a series, just two matches. We didn't have much preparation, and [Richard] Hadlee was out injured. John Bracewell and Andrew Jones were in. We were well under strength, and I remember Australia batting first on a really good wicket. David Boon got 200 and Dean Jones got 99. They got 520. I got 76, Martin Crowe 50-odd, but we were still 290 behind. They enforced the follow-on, and they had [Terry] Alderman, [Geoff] Lawson, [Carl] Rackemann, and Merv Hughes who bowled very well. And they didn't play a spinner, [Allan] Border was the only spinner. How do you approach such an innings? There was a bit of a long haul, over two days, six sessions. You bat nearly 12 hours. It's a long time, and I was very slow, I averaged about 12 runs an hour, but it was the situation of the game, really. Probably for those two days I played the best I have played at that level, in the context of having to save the game and trying to bat time and being focused every ball. I remember getting up early every morning, going for a swim, having a shower, having breakfast, and going down to the nets early. Brendon Bracewell was my room-mate, and he would bowl to me every morning for an hour. There were routines I followed during that game. I used to go and have two pints of Guinness at the pub across the road from the Sheraton, where we stayed. Religiously. No more than two. You need to bat the next day. Did you believe then you had it in you to play such an innings? I had started my Test career quite well. I hadn't batted that long before, but I had scored a hundred in my first Test. The year before I went to Perth, we went to India in 1988. I got caught bat-pad off Arshad Ayub in the first Test and thought, "How I am I going to survive out here?" But in the next Test I got my bat out in front of the pad and started to hit the spinners - not aggressively, but just hit them as opposed to bat-pad. In Hyderabad, we were 220-odd for 6 at the end of the first day's play, and I was 60 or 70 not out, and the next day we lost four wickets for 30 runs and I was left on 90 not out. But going into Perth I had had a little bit of success in Test cricket. How difficult is to not get bogged down? I never really had a worry about not scoring runs. If you are playing well on a good pitch, the runs come. Yeah, they come slower than you like. I actually remember not playing the cut shot through the innings, 11 hours, until the last half-hour, when the game was saved. Well, just cutting out that there [plays a cut with his hands] is a risky shot, than this [plays straight down the ground]. Mentally I was like, "I have to play straight as I can, as long as I can." I didn't say, "Don't play the cut," I just said, "I have to play straight, I have to play straight." I got into a rhythm when I was leaving stuff I could have probably hit, but I could have also got out, with a couple of gullies in. What keeps you going in such a long innings where there are no milestones? I had a really long time in the 90s, and I'd be lying if I said I never thought about the century. But the slowness helped: if you are scoring at 13 an hour, it means the century will take some time coming. There was also the context of the game. You are following on, 290 behind, and it was about batting time, you know - little targets. An over meant four minutes, four overs 15 minutes. Eight overs meant half an hour. Fifteen overs an hour. "I was going around asking guys for a pair of trousers, and most of them didn't fit. John Bracewell gave me his, but they were quite tight. And I actually went out there with them on. I felt really conscious, which worried me quite a lot. We're batting on the last day and we have a chance to save it and I'm worried about trousers"
The only focus was to blunt the four-pronged attack. Merv Hughes bowled bloody quick in that match, and then Rackemann, who kept hitting the deck, and Alderman and Lawson, who were swing bowlers. You look at Test cricket today, it is pretty entertaining, scoring at four an over. Back in those days, you were two and a half. You might have a day here and there where you might score three and a half. There was a different mentality back then. Once you have batted a considerable amount of time, you actually start believing you can do it, as opposed to just starting out in hope. Is it more difficult to keep your concentration then? When you are trying to save a game like that, if you start thinking about the end you are history. So, little targets. I used to get off - slowly you got to an hour, the drinks break, and then two hours, lunch break or tea break. Get off, get a shower, get a cup of tea, new gear on and start again. Just restart each time. Yeah, you have done great for a couple of hours, but you have got to go back and do it again. The Aussies must have sledged the life out of you? They were pretty grumpy. If you bat for two days, they got grumpier and grumpier. Border, they called him Captain Grumpy not for nothing. Steve Waugh and Border. Boonie was pretty quiet. He was a non-Aussie, really, when it came to sledging, but Steve Waugh made up for it. And, you know, Rackemann. I didn't react, I just listened to it. Steve Waugh called me a name about - I played 435 balls - 435 times. Plus the over change. It wasn't a very nice name. There were subtle variations to that name where the word "fat" was used too. At the end of the game I said "Thanks [followed by the same name, Kiwi replaced by Aussie]." I enjoyed that. But isn't it satisfying to give it back to them with a clever one-liner when you are doing well? You have got to be careful when you are batting. If you get involved too much, you lose your focus to bat. I think Hughes spat at me once in Auckland. He just came down the wicket - and he used to swear all the time - but this time he decided to spit at me, and he got me in the pad. And he got into trouble because he was on TV. He got reprimanded for that. I went to their dressing room and had a beer. He had ice on his ankles, his knees and his hips. Sitting down on the floor. I had a beer with him for half an hour, giving him some about spitting at me. Did you drink with them during the Perth Test too? In the dressing rooms we used to drink. After the game, good guys. Border was a tough competitor on the park, but off the park he would have a beer with you and chew the fat, and you learned from those guys. How was it to bat in someone else's trousers? You wouldn't believe it. I think it was the last morning. Must have forgotten my pair of trousers. I had my shirts, my socks… and I got there and realised hadn't got my trousers. Don't know how I forgot them. Because I had batted for so long, they might have been dirty, or might not have been washed. And I'm one of the bigger guys around. I was going around asking guys for a pair of trousers, and most of them didn't fit. John Bracewell gave me his, but they were quite tight. And I actually went out there with them on. I felt really conscious, which worried me quite a lot. We're batting on the last day and we have a chance to save it and I'm worried about trousers. I think someone went to the hotel and got my trousers. I was able to swap Brace's trousers for mine at lunch. I felt really comfortable.